It is extraordinary product with a complex composition in which you will find not only the branched chain amino acids BCAA but also SAA, and extras such as citrulline malate, and taurine. By using the products Your recovery will come at the highest possible level, and this will translate into a maximum possible effects! 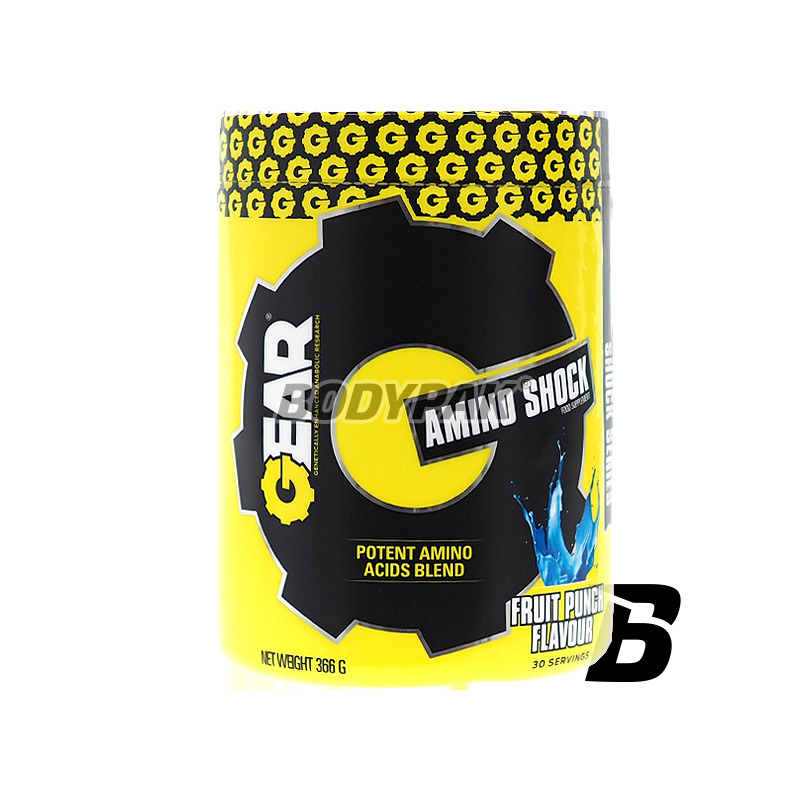 Gear Amino Shock stands out from the competition thanks to the thoughtful composition, so you can improve your results sport. Also, the solubility of BCAA contained in the product is at the highest possible level - you can forget about problems with floating lumps in a shaker! Interesting and rare are the addition of amino acids SAA obtained from the cocoon of a silkworm. 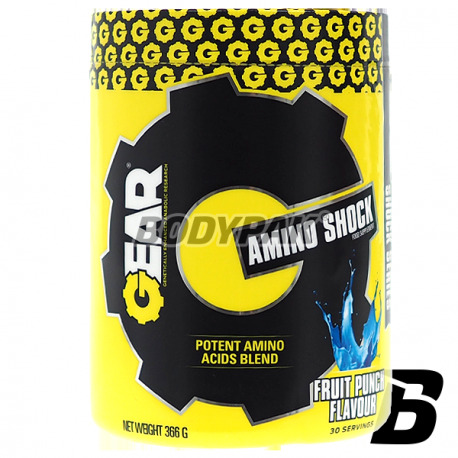 AMINO SHOCK is the most advanced amino acid complex essential for promoting physical activity in athletes. It contains a special combination instanizowanych BCAA, L-glutamine, citrulline malate, taurine and amino acids SAA obtained from the silkworm. BCAAs are provided in a concentrated composition instanizowanych branched chain amino acids (leucine, isoleucine and valine), in the ideal ratio of 2: 1: 1. Similarly, as vitamins, are exogenous substances, which means that they must be provided with food. BCAA is a basic component of muscles, constituting nearly 40% of their dry weight and the necessary anabolic bricks that will build rock-hard muscles. Free forms of BCAA amino acids are absorbed directly into the bloodstream, because they do not have to be subject to the processes of digestion and thus immediately after eating can get where they are most needed. Glutamine is the main ,, magazine and transporter "nitrogen in the human body. Nitrogen is an element characteristic of a protein which is not present in the fat or in carbohydrates. The amount of accumulated protein in the muscles is measured by the amount of nitrogen retained in the body and this phenomenon is called the nitrogen balance. The higher the nitrogen balance - the bigger, stronger and more durable are the muscles. Provision of glutamine from the outside in the form of additional supplementation leads to the creation of high-value nitrogen balance, which is the state of the internal environment of the human body, which promotes anabolic processes and at the same time effectively inhibit catabolic processes.
.  S. Shin, Yeon S., D. Park, Oh J., H. Kang, Kim S., et al., Silk Amino Acids Improve Physical Stamina and Male Reproductive Function of Mice - Biol. Pharm. Bull. 33 (2): 273-278 (2010). Citrulline Malate is a specific combination of the amino acid citrulline and malic acid in one molecule, characterized by a very good solubility in liquids and high chemical stability. Research has demonstrated the athletes, it improves exercise capacity and reduces fatigue in subjects as well as beneficial effects on acid-base balance. Theoretical considerations and practical trials suggest that citrulline malate supplementation may have broad application in supporting physical activity at every level of fitness. Taurine is an amino acid conditionally-essential, rising from methionine and cysteine, which occurs in the human body as a free amino acid or an ingredient of simple peptides. This amino acid is admittedly not part of the constituent body proteins, but it is necessary in the process of their transformation. Like the glutamine nitrogen accumulates in the body. Another important function of taurine is to reduce the production of serotonin. Fewer produced serotonin causes the body does not feel tired and may continue to exercise much longer. IF you strive for EXCELLENCE - THIS PRODUCT IS DESIGNED FOR YOU! * SAA has all amino acids protein but only the listed represent more than 2% by number, and have been listed for reasons of their greater relevance Ingredients: Instanizowane BCAA (L-leucine, L-isoleucine and L-valine), L-glutamine, citrulline malate , SAA of amino acids, flavorings, taurine, acidity regulator (citric acid), sweetener (sucralose), anti-caking agent (silicon dioxide), color (indigo). BCAA i dodatki - cenowo wysoko, ale czasem cena jest uwarunkowana jakością i tak to by w tym przypadku wyglądało. Rewelacyjna regeneracja po treningu! Tego potrzebowałem, bo chodziłem na prawde w złym stanie w ostatnim czasie. NOW Foods L-Arginina & L-Ornityna - 100 kaps. L-Arginine L-Ornithine & supplement containing a unique combination of amino acids that promote the production of somatotropin - human growth hormone (Human Growth Hormone). Advanced formula combining high quality BCAA amino acids and additives such as bottleneck caffeine, green tea extract (natural source of polyphenols) and ginseng! Ideal choice during weight loss - not only protects the muscles from catabolism, but supports the process of fat burning! The highest quality formula at your fingertips! Olimp BCAA 1100 Mega Caps - 300 kaps. Effective and economical branched chain amino acids! Thanks to the appropriate production technology in one capsule zmieszczono up to 1100mg BCAA! Protect your muscles from breakdown and accelerate their development! Excellent branched chain amino acids in a 4: 1: 1. The increased amount of L-leucine enhances anabolic effects, but also improves anti-catabolic effect. Very soluble with refined taste. Bet on the quality!